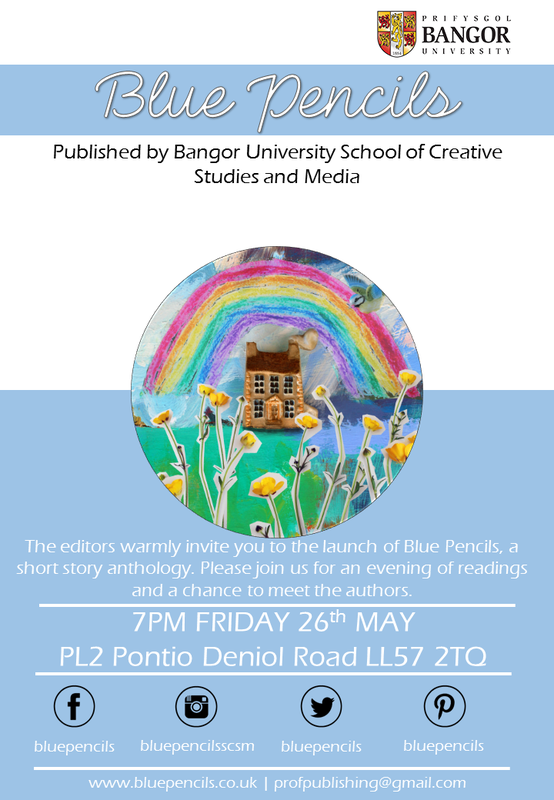 Bangor University’s School of Creative Studies and Media are pleased to announce the publication dates for two anthologies – Blue Pencils and SCSM’s Media Medley. Four students in the School of Creative Studies and Media (SCSM) have been working together for the past four months to produce and publish an anthology of short, original fiction. The resulting anthology, Blue Pencils, features work by authors across the world, from as far afield as Tunisia and the USA, as well as writers in the UK. Originally the anthology invited submissions based on the idea of ‘inspiration’, but the work has since evolved into a more far-reaching study of humanity on every level of the imagination. The book will be unveiled at a public book launch taking place on 26th May at Pontio, Bangor University’s Arts and Innovation Centre. Advance copies of Blue Pencils will be available for purchase prior to the launch through the University’s online shop. One of the students on the Blue Pencils team, Charlie Wilson, has also taken on another publishing project this semester. SCSM’s Media Medley is a collection of work by both current and former Creative and Professional Writing BA students. This exciting and varied anthology includes short stories, scripts, poetry and essays by students of the graduating years 2014-2016 and those graduating this July. SCSM’s Media Medley will be available from 26th June. Dr Eben Muse, Head of School, said: “The editorial team of students, under the supervision of Dr Lyle Skains, have designed and published a pair of beautiful volumes that make the creative writing of Bangor students available for the first time to a world-wide audience.” Both students and staff in the School of Creative Studies and Media welcome the public to the book launch with an invitation to join them in celebrating the achievements of these students. The Book Launch will commence at 7pm on 26th May and is open to all. Copies of Blue Pencils will be available for purchase on the night and further information about SCSM’s Media Medley will be announced during the event. Further information and the latest news about Blue Pencils can be found here. If you would like more information about the Book Launch, please contact: profpublishing@gmail.com.